When we say the word “Squirrel” it immediately conjures up images of Beatrix Potter like figures, all warm and cosy and fairytale like. Unfortunately the reality is often very different, and squirrels can be a real problem for some people. There are people who actively encourage squirrels by feeding them. In other cases people are unknowingly increasing the population of squirrels by feeding birds. Bird food is a great source of high protein food, not only for birds, but also for squirrels, rats and mice. Concentrations of these pests can have a devastating effect on local insects , other rodents and mammals as well as newts, slow worms, frogs and toads. 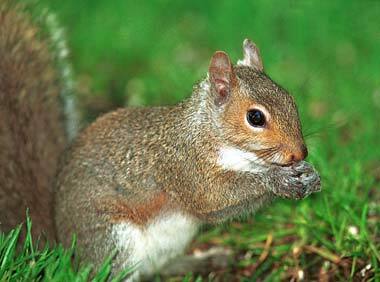 The more food in a squirrels territory the smaller the territory will have to be thus allowing the population density to increase. 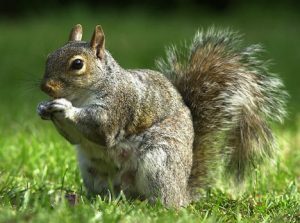 Squirrels will also eat baby birds and birds eggs, so by having bird feeders that squirrels can access, can encourage squirrels into gardens and allow them to easily reach and kill birds that people are trying to protect. Most of the calls we get within our catchment area (Berkshire, North Hampshire, North West Surrey, South Oxfordshire and South Buckinghamshire) are for problems with squirrels entering roof spaces. A male squirrel will have several dreys within its territory and a loft space is often treated as one of these and may only be visited every now and then which can make treatment difficult. In warm weather squirrel families are unlikely to visit lofts as the temperature may be too high. Lofts are often favoured for giving birth, especially for the first litter of the year when the temperature is still quite cold. PestUK use a combination of traps, (usually Fen traps but some times Kania) and a warfarin based poison to control squirrels. Some pest technicians favour poison over traps. This method takes longer and the poison needs to be treated with an attractant such as sugar, chocolate flavouring or rat attractant. Squirrels can be fussy feeders, particularly if they have access to a bird feeder full of peanuts and bird seed. The reason for this is that they can be fussy feeders, especially if they have access to peanuts, sunflower seeds and bird seed. If a squirrel is poisoned outdoors then a special feed hopper has to be used (it is illegal not to poison this way outside). If traps are used we use special containers to prevent birds and other animals being caught in them. To book a pest control treatment or free advice then please call us at PEST UK: 0330 100 2811 (local rate) or 0800 026 0308 (free from land lines & some mobiles).